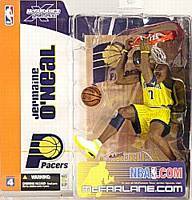 Description Of Item: McFarlane's Sports Picks: NBA series 4 is a special bonus line for 2003. Dubbed the Debut Line, it features four players - rookies and established hardwood vets - who have never before had an action figure produced. Figures are dressed in official team uniforms and include bases.